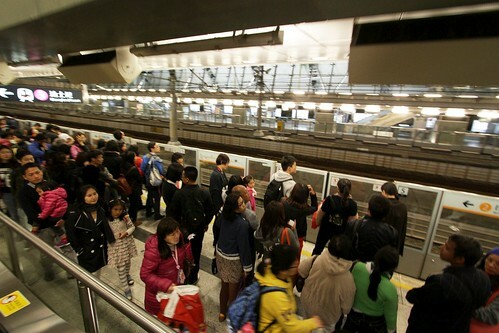 One thing the Hong Kong MTR is known for is the ease of navigating the network, with well designed stations making it simple to change between different lines on your way across the city. 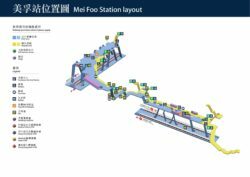 Here is a summary of the different interchange station layouts found on the MTR system. A cross-platform interchange is when a passenger can change from one train to another train on a different line, without having to the platform. Diagram by Herenthere, via Wikimedia Commons. When one terminating railway line joins a second through railway line, four possible interchange movements are possible. Two island platforms at a single station are sufficient to serve all movements. In both cases, interchange movements can be classified as ‘same’ for passengers changing to a train in the ‘same’ direction, or ‘inverse’ for those heading back the opposite way. 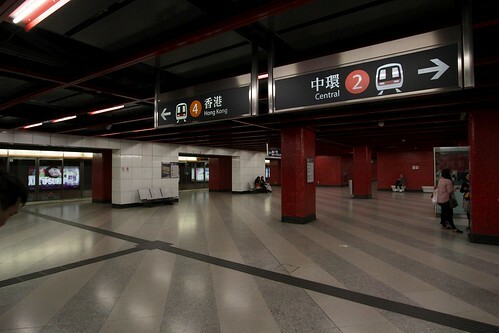 The original full cross-platform interchange complex in Hong Kong was created at Mong Kok and Prince Edward stations when the Tsuen Wan Line was added to the original single line MTR system in 1982. The ‘inverse’ cross-platform interchange occurs at Prince Edward, with the ‘same’ direction interchange at Mong Kok. 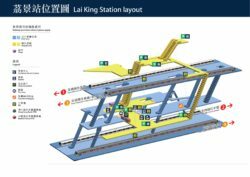 The same arrangement was created at Tiu Keng Leng Station (‘same’ direction) and Yau Tong Station (‘inverse’ direction) in 2002 with the opening of the Tseung Kwan O Line, which took over the cross harbour portion of the Kwun Tong Line. 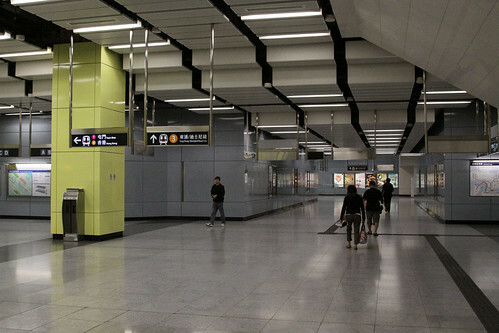 Admiralty Station provides an ‘inverse’ direction cross-platform interchange between the Tsuen Wan Line and the Island Line, for passengers heading to/from the east of Hong Kong Island. 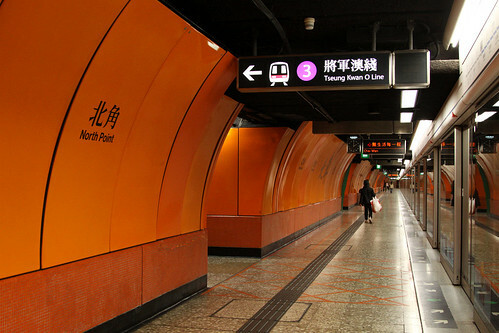 North Point Station provides a ‘same’ direction cross-platform interchange between the Tseung Kwan O Line and the Island Line, for passengers heading to/from the downtown area of Central. This interchange was retrofitted to the station in 2001, to ease congestion at neighbouring Quarry Bay Station. 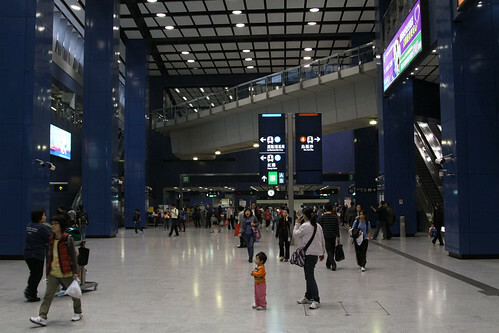 Lai King Station provides a ‘same’ direction cross-platform interchange between the Tsuen Wan Line and Tung Chung Lines, with citybound and outbound lines running parallel. 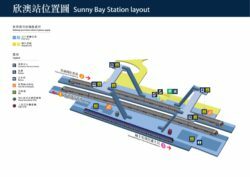 Sunny Bay Station serves the Tung Chung Line and the Disneyland Resort Line branch, with three platforms – one being an island. 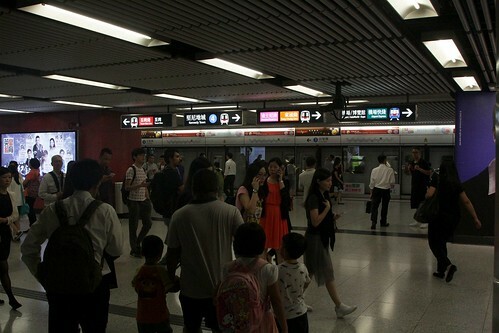 Passengers from the city headed to Hong Kong Disneyland have a cross platform interchange, as do Disneyland passengers headed for Tung Chung, but all other movements require changing to the citybound Tung Chung Line platform. 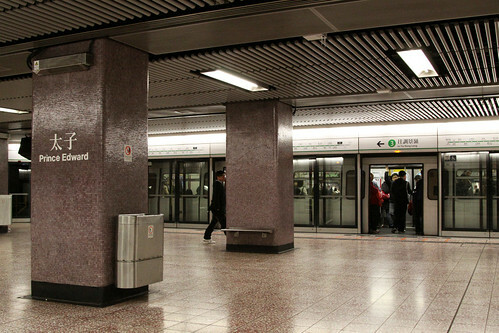 Tai Wai Station on the East Rail Line is terminus of the Ma On Shan Line and has a total of four platforms – one island and two side platforms. 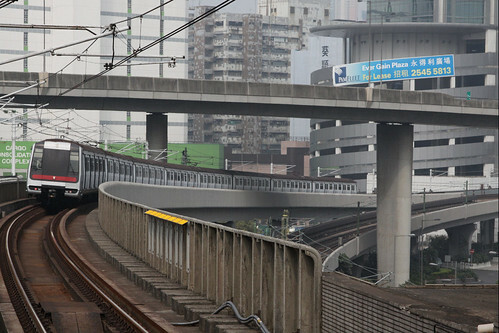 The terminating platform used by citybound Ma On Shan Line trains has a cross-platform interchange with the citybound East Rail Line, but all other movements require a platform change. 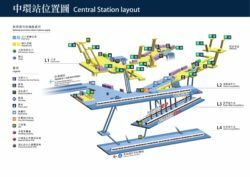 Hung Hom Station provides a same direction cross platform interchange between the East Rail and West Rail lines, with terminating trains alternating between the two island platforms, but not in a coordinated manner, so a platform change is sometimes required. 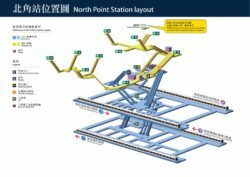 The Tseung Kwan O Line has two branches – one to Po Lam, the other to LOHAS Park. 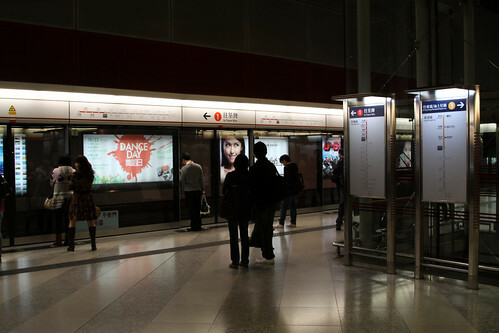 During off-peak periods LOHAS Park Station is served by shuttle trains, with passengers changing at Tiu Keng Leng or Tseung Kwan O to continue their journey. These shuttle trains use the same platform as mainline services in the ‘same’ direction, so only ‘inverse’ movements require a platform change. 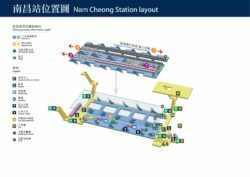 Nam Cheong Station was built as the interchange station between the MTR Tung Chung Line and KCR West Rail. Before the integration of the two networks, fare gates separated the two sets of parallel side platforms. 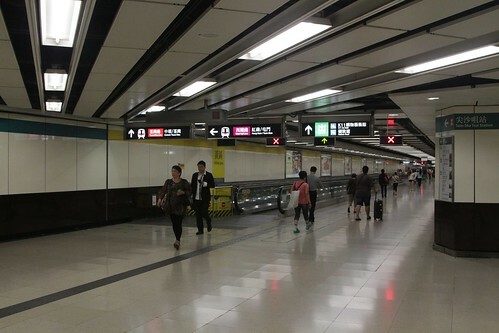 After the merger, the wall between two of the platforms was opened up, enabling cross-platform interchange between southbound Tung Chung Line and northbound West Rail Line trains. Building a cross-platform interchange requires the two intersecting railway lines to come together and run parallel to each other – which often requires costly tunnels and viaducts. Where this cost cannot be justified, a simpler option is to provide separate platforms on each line, with interchange passengers using escalators, stairs and lifts to move between the two. 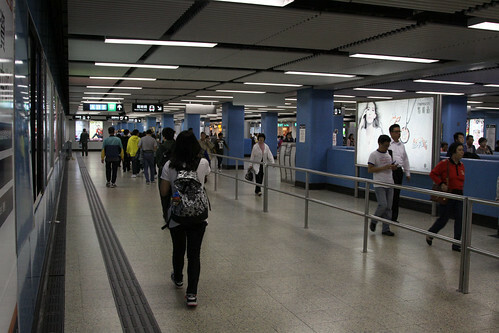 Central Station between Island Line and Tsuen Wan Line is one example, with direct access between the two levels via a single escalator or lift. Where the two sets of platforms are located at vastly different depths, were built at separate times, or are separated by great distances, it may not be possible to install a direct lift or escalator between the two. Instead a separate concourse level is inserted between the two platforms, with passengers required to change elevation twice when changing between platforms. 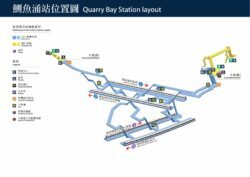 Quarry Bay, between Tseung Kwan O Line and Island Line. 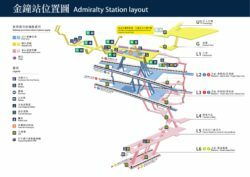 Admiralty Station, between South Island Line and Island Line / Tsuen Wan Line. 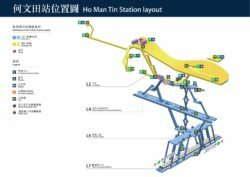 Ho Man Tin Station, between Kwun Tong Line and Shatin to Central Link. 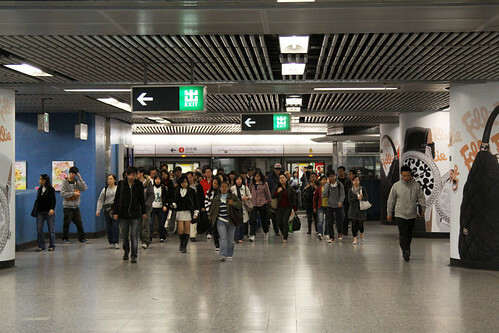 Mei Foo Station, between Tsuen Wan Line and West Rail Line. 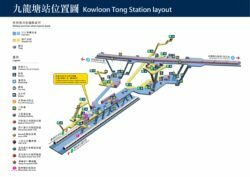 Kowloon Tong Station, between Kwun Tong Line and East Rail Line. 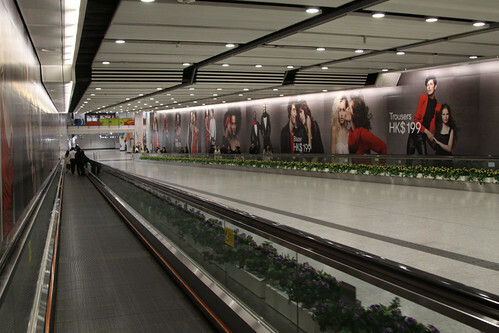 Central Station (Island Line and Tsuen Wan Line) is linked to Hong Kong Station (Tung Chung Line and Airport Express) by a long underground passageway, located inside the paid area at concourse level – in effect making them the same station. 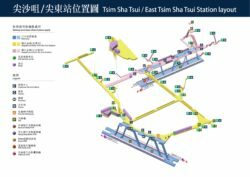 Tsim Sha Tsui Station on the Tsuen Wan Line is linked to East Tsim Sha Tsui Station on the West Rail Line by a network of underground passageways that are open to the general public, with interchange passengers in effect exiting one station then entering the second. 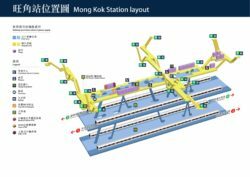 Mong Kok Station on the Tsuen Wan Line and Mong Kok East Station on the East Rail Line are a 10 minute walk apart via elevated pedestrian footbridge system. 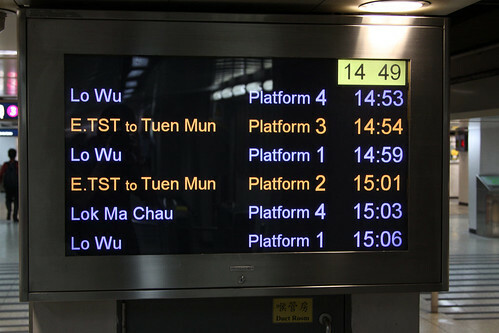 Both stations originally had the same name, the latter being changed after the MTR and KCR system were merged. 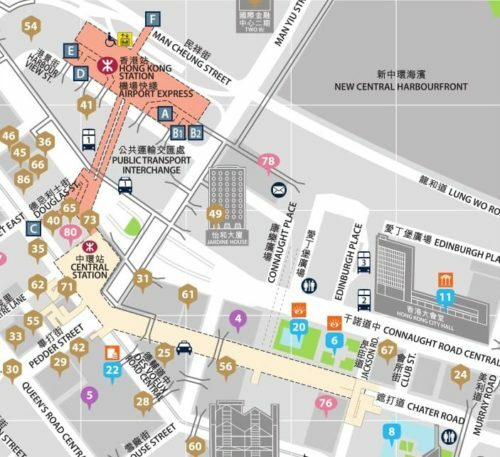 Tsuen Wan Station on the Tsuen Wan Line and Tsuen Wan West Station on the West Rail Line are in the same area of Hong Kong, but are 1.5 kilometres apart, 15 to 20 minute walk. 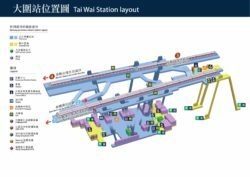 The MTR website has ‘Station Layout’ diagrams that give a 3D view of each station on the network – you’ll be amused for hours! Here is a selection. They also have ‘Location Maps’ for each station, showing where each exit emerges at street level. 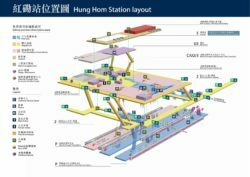 This entry was posted in Transport and tagged cross-platform interchange, East Rail, Hong Kong, Mass Transit Railway, MTR, rail operations, railway. Bookmark the permalink.